Mix flour, brown sugar, baking powder, baking soda, and salt in a large bowl and set aside. Using the paddle attachment on a stand mixer or twin beaters mix the yogurt, milk, vanilla and egg. Add dry ingredients and mix until just blended. Add the warmed peanut butter (warm in microwave for one to two minutes until softened) and mix until blended thru. Gently stir in melted butter. Heat large scan pan or nonstick skillet over medium heat. Drop ¼ cupfuls for each pancake onto the griddle, spacing apart. 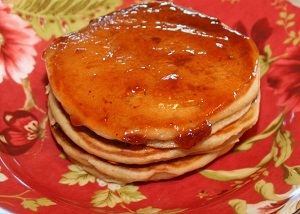 Cook pancakes until light brown on the bottom and bubbles form on top. Gently turn pancakes and cook until pancakes are firm. Transfer to plates. Stack as many pancakes as preferred on each plate and top each pancake layer with warmed strawberry preserves, or serve with warmed maple syrup.